The USGBC Green Veterans program is dedicated to helping our nation's heroes learn about sustainable building and green living, while at the same time helping ease the hardship of military-to-civilian transition. By empowering Veterans to be volunteer leaders in their communities, the program's goals are to nurture opportunities for continuing education, networking, employment, corporate engagement and green entrepreneurship. Thanks, also, to those who have stepped up to create a funding platform for our Sustainability Training Program through our GoFundMe Campaign. This campaign runs through December 31, so please make a contribution and help us continue to make a difference in Veterans' lives. Every $25 donation counts! As with all USGBC initiatives, the lifeblood of the Green Veterans is our volunteers. check out our dynamic leadership group's bios in the box above. If you are interested in joining our ranks, click here. Local Green Veterans Group programs are diverse and productive. We have discussed the realities of Post Traumatic Stress Disorder and the role of therapeutic gardens and building design on stress reduction and PTSD treatment. We have collaborated with local nonprofits to collect furniture for Veterans, and also pulled together a team to repair a Veteran's home. We have teamed with key partners to refurbish a local VFW post. And we have gathered socially to grow our ranks and discuss our mission. If you are interested in joining the Green Veterans and USGBC volunteer family, reach out to us here. The US Department of Veterans Affairs (VA) will reimburse the cost of both the LEED GA and AP exams. In accordance with the GI Bill, this reimbursement is available to any US military Veterans, eligible dependents, and reservists. Eligible candidates may seek up to $2,000 in reimbursement, and even if you don’t initially pass the exams, subsequent attempts are also covered (up to $2,000 in total). Exam fees are also retroactive to December 3, 2008. Learn more about the VA reimbursement program. 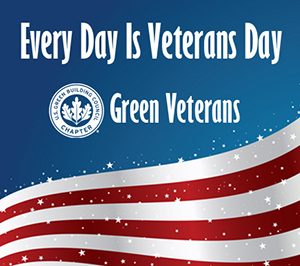 The Green Veterans initiative is about empowering Veterans. One of several tangible manners this is accomplished is through our Green Veterans Sustainability Training Program. In collaboration with Palm Beach State College and the Institute for Energy & Environmental Sustainability, the Green Veterans Sustainability Training Program provides its graduates with education geared toward securing LEED Green Associate accreditation and Building Performance Institute (BPI) certification. Excluding written and practical examinations, the course requires 96 class hours. LEED Green Associates have a documented, up-to-date understanding of the most current green-building principles and practices -- this professional credential identifies a leader in the ﬁeld and an active participant in the green-building movement. A BPI Energy Auditor's expertise ties to the various components of building science, including combustion safety, blower-door testing, energy analysis, and home-performance assessments -- this professional provides homeowners with information necessary to reduce energy usage and costs. Successful graduates of the Green Veterans Sustainability Training Program are provided an opportunity to begin utilizing their new education by working with programs such as Rebuild Together and Habitat for Humanity to improve skill sets. Additionally, graduates are given the opportunity to intern with the Solar Energy Loan Fund (SELF) as approved contractors participating in SELF's Veterans Helping Veterans program. This hands-on program provides an avenue for Veterans who are seeking green-job skills to retrofit homes for fellow Veterans who are living in poor conditions and struggling with utility bills. Further employment opportunities for graduates are possible through our partnership with CareerSource Research Coast. To learn more about the Green Veterans Sustainability Training Program, contact Brian Sales or Edel Travieso.